Despite its remote location, Alamo Lake State Park receives relatively large numbers of visitors in the mild seasons of spring, winter and fall, mostly because of the good fishing it offers - bass and catfish are especially plentiful. 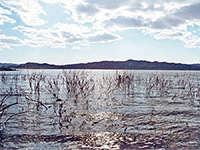 The reservoir was formed in 1968 by the construction of Alamo Dam for flood control purposes on the Bill Williams River, and is now the fifth largest in Arizona, though as with all Southwest lakes, the surface area varies a lot from year to year. The lake is enclosed to the south, west and north by low, barren hills and beyond by mountain wilderness areas, and although not especially interesting itself, the state park is a good place for a few days relaxation, or as a base from which to explore the surrounding lands. The desert setting and low elevation (1,230 feet) result in uncomfortably hot conditions in summer. 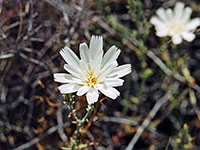 The best time to visit Alamo Lake State Park is during spring because of the profusion of wildflowers and cactus blooms beside the lake and in the desert around the 33 mile approach road, which starts at the little, rather forlorn town of Wenden on US 60. The route heads due north, climbing gradually into the Harcuvar Mountain range, and soon enters a very fine region of unspoilt Sonoran Desert habitat. 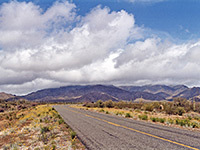 The hills have a few mines and side tracks, but once past them and into the wide Butler Valley beyond, the land is completely undeveloped with many flowers and cacti including numerous healthy saguaro; the long straight road running through and distant rocky mountains make for a perfect Arizona scene. 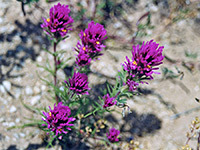 Some of the plants occur in patches, depending on the elevation, most noticeably purple owls clover, yellow brittlebush and orange California poppies. At the far side of the valley, the road curves around the edge of the Buckskin Mountains and gradually descends towards the lake. There are many options for free camping on the hillsides around the last few miles before the state park boundary, but once inside this is only permitted at the designated site, for appropriate payment. The main route leads to the dam and an overlook just before; the dam is not so spectacular, just a wide stone embankment, but the lake looks nice, winding eastwards between distant shores and even more remote hills in the distance. The very end of the road is private but open to foot travel, and from here begins the hike down the Bill Williams River Canyon. Two other side roads end at the lakeshore - these pass boat launch sites, the campsite (which is not near the water), picnic areas, general store and ranger station. The nearest towns with hotels close to Alamo Lake State Park are Lake Havasu City, Parker and Wickenburg.